Adamovic basses are very rare to find on the used market even though around 80 basses are made each year.. This is because 95% of all basses ever made are still in the hands of the original owners, something they are very proud of, and rightly so. This example features a very beautiful flamed redwood top, with a Limba body, a rampbar pick-up. The neck is made form maple and purpleheart and has a stabilized spalted maple fingerboard. The bass is totally unique, and would cost in excess of £4500 today. 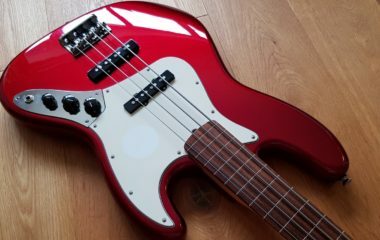 Adamovic started building basses in the 1990’s because of back and shoulder problems, and not being able to find a light-weight instrument with the ergonomics required. The bass is finished in Shellac, and has some cool looking weather-checking, associated with this finish. It’s in extremely good condition with just a couple of small marks stopping it being mint. It is standard 34″ scale, and has a Glockenklang 3 band preamp, Hipshot Ultralite tuners and hipshot bridge. Comes in a Hiscox hard case.